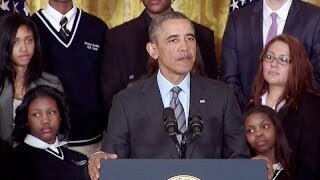 At a White House press conference attended by HCZ Promise Academy students, staff and President/CEO Geoffrey Canada, President Obama announced the country’s first five Promise Zones, which will be based on the HCZ model. 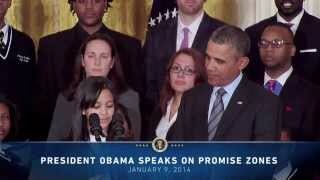 Promise Academy ninth grader Kiara Molina introduced President Obama at the event, who quipped that Kiara’s was the best introduction he had ever had. Watch Kiara’s introduction here and the entire press conference here.